Part 1A: About That Next Field — Haven’t We Been in This One Before? I think you know how that goes. Now they appear capable of feeding themselves so I am free to return to this activity. This is true of a dear friend who was a world-famous environmental engineer and now wins storytelling contests and has his short stories published. Ditto for the videographer and henna artist who has two highly successful radio programs in northern California. Data analysts go back to being songwriters, carpenters rediscover their acting chops, psychologists who apply everything they have learned to directing new theater works, and on and on. Those who endured and stayed within their artistic pursuits their whole lives deserve honor, but those who return to them remind me of a quote by the Native American painter TC Cannon that I encountered the other day: “How thoughtful of God to provide such a life-stream such as art.” Bingo. What is the play about? 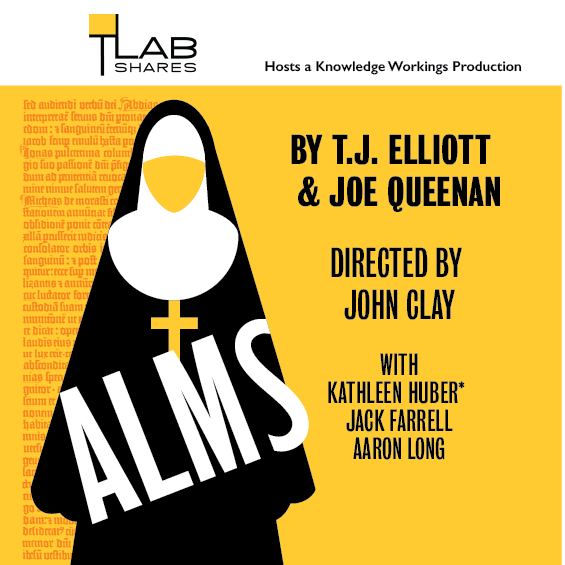 A Beliefs collide in darkly comic but ultimately meaningful ways in this late-night meeting of a zealous young Catholic convert, an involuntarily retired sportswriter, and the nun who taught him fifty years earlier as they assemble packages for the homeless — alms for the poor. John Clay directs a compelling cast of Kathleen Huber*, Jack Farrell, and Aaron Long for this play. Even New York Times notable author and Wall Street Journal columnist Joe Queenan reinvents himself in this enterprise. Joe has written nine books, thousands of articles, a trove of unpublished stories, but this is his first play. No matter what happens with this reinvention or re-reinvention we believe that this is exactly what we should be doing with our combined 175 years. And next week in the second regular installment of Leaving the Field: An Idiosyncratic Guide to Reinvention, I will share the first of the principles that seem to be important to success in such ventures: Search.